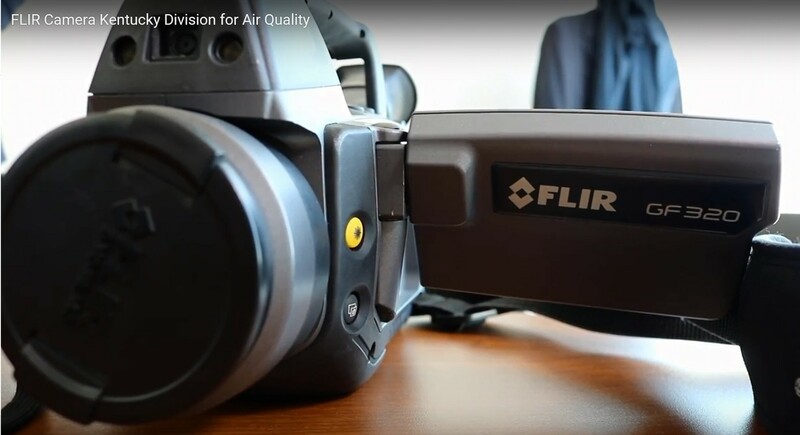 A special camera, used by the Kentucky Division of Air Quality (DAQ), is enabling air quality inspectors to detect air pollution. The Forward Looking Infrared Camera, or FLIR (pronounced “Fleer”), helps facilities discover potential leaks of volatile organic compounds (VOCs) that could be harming air quality and costing money. The human eye sees only visible light, which occupies a narrow portion of the total light spectrum. But there are many other kinds of light along that spectrum such as infrared, ultraviolet, x-rays and gamma rays. Even radio waves are a form of light. Think of the spectrum as a road, and specific wavelengths of light as addresses along that road. VOCs live in the infrared “address” of the spectrum. The fumes from a lighter are demonstrated on the FLIR camera. DAQ’s FLIR camera can identify 19 unique compounds including methane, benzene, and hexane. Some of these substances are used in industrial processes, while others are by-products. If a facility emits above a certain threshold amount of these or other pollutants, it must be periodically inspected to ensure compliance with its operating permit. Most chemical manufacturing processes use controls that trap or combust VOCs before they escape through the smoke stack. The camera is especially useful in identifying leaks in chemical storage or manufacturing areas, prior to the pollution controls. During an inspection, inspectors point the camera at ductwork, feeder pipes, and storage tank valves. Leaks, if they exist, show up as ghostly plumes in the camera. Kentucky received the camera through a grant from the Environmental Protection Agency (EPA) in 2015. So far, 39 out of 100 inspections have revealed previously unknown leaks. Another time, an inspector used the camera at a landfill to identify a broken methane line that had been nicked by a lawn mower. When leaks are found, facilities get a copy of the video. The footage helps pinpoint the source of the leak, making it easy to identify where the problem is. “Sometimes, the camera can even help raise awareness on potential hazards in the workplace,” said Lents. On a visit to a production line for rubber door seals, inspectors noticed that workers were leaving a shield open around the conveyor belt. The shield was meant to protect workers from invisible VOCs. Video from the FLIR helped convince workers to utilize the shield. The FLIR camera is demonstrated. “When workers realize they are being exposed to hazardous fumes that might otherwise be shielded by standard safety equipment, they are much more likely to remember to use that equipment properly,” said Lents. For more information on the FLIR camera, please contact Roberta Burnes by e-mail at Roberta.Burnes@ky.gov.